If you’re looking for an elegant and sophisticated pre-owned vehicle to drive, you need to take a look at the selection of INFINITI vehicles offered at Ray Brandt INFINITI. This dealership near Metairie, LA offers you the selection you’re looking for and the quality ride you want to enjoy on a daily basis. Stop by and let this team help you choose the right model to drive. Many of these pre-owned vehicles are lease returns that are offered with low mileage and affordable pricing to give you a fantastic drive. 2018 INFINITI Q50 3.0t Luxury – Take a ride in this gorgeous sedan that has the sporty appearance and the fantastic features you want to enjoy. Just imagine how great it will feel to take this impressive model on the roads in Metairie, LA where you can experience the ride you want and the comforts of an excellent luxury vehicle. 2018 INFINITI QX80 – Do you want to enjoy a large and luxurious SUV for your driving pleasure on the road? If so, this could be the right one of the pre-owned INFINITI vehicles offered that will make it easier for you to enjoy the drive you’re looking for. Take this impressive model out for a ride around Metairie, LA and see if it’s the right one for you. 2013 INFINITI M37 – Here’s a gorgeous car that has the benefits of AWD to give you the ride you’re looking for. When you want smooth and elegant luxury on the road, this is the car that can give you exactly what you’re looking for. Get behind the wheel and feel the comfort that can be yours for an extremely reasonable price. 2016 INFINITI QX60 – Let this midsize SUV become the one that will offer you the driving experience you’re looking for. As one of the most impressive pre-owned INFINITI vehicles offered at this dealership near Metairie, LA, you’re going to be able to take this SUV home and make it the right one for you to drive and enjoy every day. 2017 INFINITI QX50 – The smallest of the SUV lineup from INFINITI is the QX50 which is the SUV that can be right for you. With the benefits of a model that was previously owned, you’re going to have the ability to pay less and drive more. Get behind the wheel of this beautiful vehicle and let it become the compact SUV that’s perfect for you to have the drive you desire. 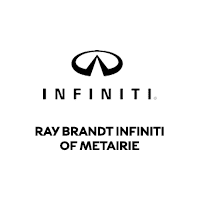 The team at Ray Brandt INFINITI has the pre-owned INFINITI vehicles you want to drive and enjoy on the roads in Metairie, LA. Come in and see what they have to offer so that you can have the luxury feeling you want while spending less to enjoy the pleasure of one of the most impressive names in the automotive world. Your INFINITI is waiting; are you ready to drive?